I ran a Twitter #Poll which started after RCB got defeated by KKR. Andre Russell has done wonder in that. Due to that Royal Challenger Bangalore faced yet another defeat in IPL2019. It is Virat Kohli's fifth defeat in a row. This Poll's lifetime is 24 hours. 17 hours is left to expire. Do you doubt Virat Kohli's captaincy? Who is better as CAPTAIN? V Kohli or Sourav Ganguly. 100 voters already appeared for this Poll. Thank you to all of them. Result of those 100 votes. 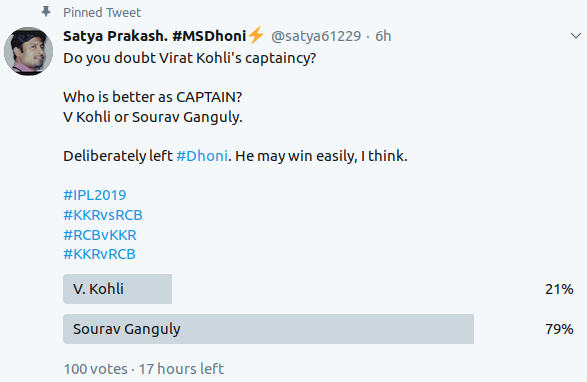 I am going to run similar Poll after Virat Kohli win few successive matches for Royal Challenger Bangalore to match the result.